Luan Krasniqi: Krasniqi vs Minto on March 17? Still not officially confirmed but Minto has been on and off as the next Luan's opponent on 17 March. 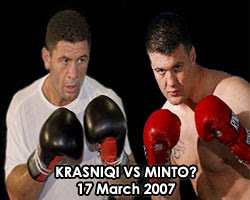 This potential fight, Krasniqi vs Minto, is becoming more so believable after Luan gave an interview to Sttugarter Zeitung recently where he referred to Minto as his next opponent: "Minto's largest weapon is his will and I will not underestimate it." - said Luan and he added that his desired opponent would have been Brewster, but apparently Klaus Kohl could not get an agreement. The other ones (Tony Thompson, Rahman and Holyfield) had to be rejected too. So that leaves Brian Minto (The Beast, 27-1-0 (16 ko's) ) the most perfect opponent at present. He is an extremely durable american fighter who stopped german boxer Axel Schulz by TKO on 25th Nov 2006 at Halle, Germany and many see this as revenge fight. "My goal remains a World Championship fight and I want there as fast as possible" - said Luan. Der Kampf findet natürlich am 17.März 2007 statt.